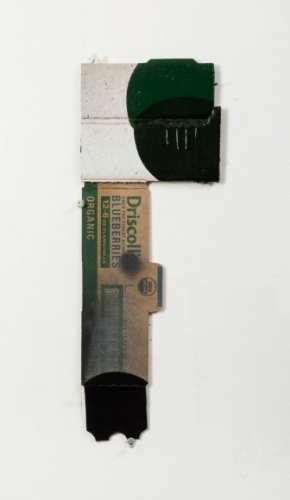 George Negroponte. Gravel Road. 2016. Enamel and latex on cardboard. 18.5" x 7"
Artist George Negroponte is about process. After almost four decades of making art, his work can be viewed in three distinct phases with the commitment to abstraction the essential connection across all. Born and raised in NYC, George Negroponte studied art at Yale with Bernie Chaet and William Bailey. His work is held in the collections of numerous museums, including the Metropolitan Museum of Art, and he has exhibited extensively in New York City and internationally since 1977. Pat Rogers: Here we are about 11 months later and a solo exhibit of your work opens at Anita Rogers Gallery in the middle of October. Can you tell me a little about the most recent work? Has your work evolved in the way you might have expected? George Negroponte: Gosh, I’ve come to expect very little but I’m grateful my work has continued to move forward. A lot of the issues we discussed last October still feel very current and relevant. I’m on a much better track these days and I sense more of a steadiness and stability in the studio. Most of these new works happened virtually on their own terms. I stepped aside. PR: What do you think accounts for the change in perspective? GN: Well, imagine taking 10 years to get home and I hope that sounds familiar. My roots are from the island of Ithaca so I imagine Odysseus may have played a role in my story, too. But in hindsight I should say that making art is really hard. Franz Kline once said it’s like waking up in the morning and finding your arms stuck in the mattress. Making art requires insights that are altogether of a different kind, like needing to see better, hear better, and probably live better. And more than anything needing to know how to receive. This probably requires a sense of balance I can’t account for. PR: It sounds tough. What do you feel is the most significant change in the new work? GN: I made singular works that stand on their own. I took the paired panels and superimposed them on each other. Now they stand on their own and it feels like a declaration of independence. PR: That is a change. Have your inspirations changed since we spoke last year? In essays written for your exhibitions, you reference Merleau Ponty, Phenomenology, Cezanne, zoology, Frank O’Hara, Vittore Carpaccio, geese, rubber boots and a host of all kinds of things. GN: I’m motivated by the idea that the Enlightenment still matters and that art and culture once elevated us from the Dark Ages and inspired us to consider our own inner lives as important and vital. Nonetheless, today our resources are probably more likely contingent, small and fragile. I’m pretty sure I’ve come to understand that when I’m working well I’m able to get beyond what I call my own. I go somewhere else. In the meantime I depend upon everything I’ve come across and I’ll use anything and everything I can possibly muster up because knowledge and experience do matter. PR: Does this mean smoother sailing ahead for your art making? PR: Funny. It's a bit dark, though. GN: Well, maybe not, because it’s cautionary, too. I’ve worked my entire life to learn a few things and that list isn’t that long. Making art is like getting clued in at a certain moment. It could be that simple, because for a moment in time you give up on yourself. You take a serious look at what really matters. Then, and only then, something starts to happen and you watch it like an observer. It’s magical because you don’t own it and you don’t control it. You can’t even help having it happen. And for a single, brief moment, you realize you’re free. That helps a lot.